Aren't unicorns wonderful? 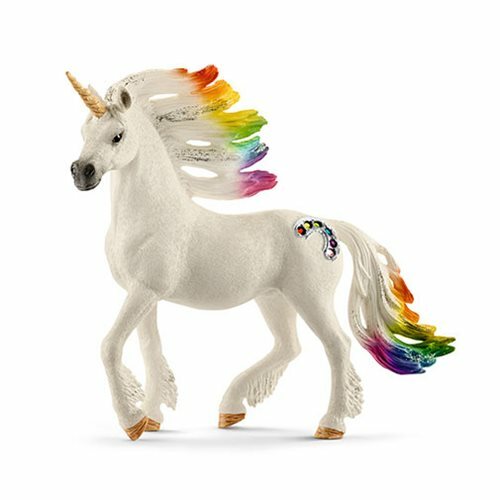 And so is this beautiful Bayala Rainbow Unicorn Stallion Collectible Figure! It measures approximately 7-inches tall x 5 9/10-inches long. The mane of the Rainbow Unicorn gleams in all the colors of the rainbow, and its flanks are adorned with colorful gemstones. The shy, noble creature is shrouded in mystery, because travelers rarely get a glimpse of him. But you can take him home if you act quickly. Collect the mare and foal, too (sold separately)! This family of Rainbow Unicorns lives on a grassy plain by the Rainbow river. In the light of the morning sun, the manes of the three magical creatures gleam in all the colors of the rainbow. Like most unicorns, they're very shy. The handful of lucky individuals who have seen them report that they're incredibly colorful and graceful. They tell tales of gemstones in all the colors of the rainbow that adorn the flanks of the magical unicorns. Many mysterious tales are told about these creatures, yet nobody knows whether the tales are true. But all the tales agree that the Rainbow Unicorns are incredibly beautiful and magical creatures.